It’s not often you find a mother willing to tackle a home renovation project during her last trimester of pregnancy, but Paige McInerney put her trust in Blackline Renovations during her garage remodel this past winter. New England transplants, Paige and Tom McInerney, bought an older home that needed a lot of updating. After completing the main home, they set their sites on expanding in the backyard. The McInerneys decided to transform an old single-car garage into a two-car garage, complete with an in-law apartment on the second floor. Friends and family often stay with the family during visits. The McInerneys also needed a quiet and private space to accommodate a home office. 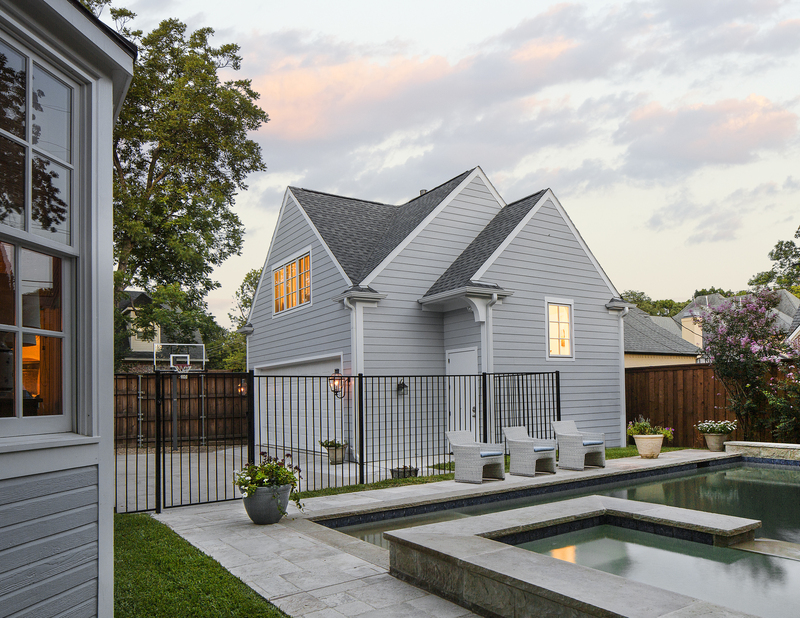 Wanting to provide both a comfortable and functional space for their guests and family, they wanted to use a design-build renovation firm in order to simplify the process, while still getting quality craftsmanship. In total, the project lasted 5 months, coming in on budget and on time. “I was very pregnant with number 4 when we started the project. I didn’t want to run around to showrooms and design centers. I was able to show Chris Black and his staff pictures of what I liked from Pinterest and Houzz and they would come back with ideas for the project that fit our budget,” said Paige. 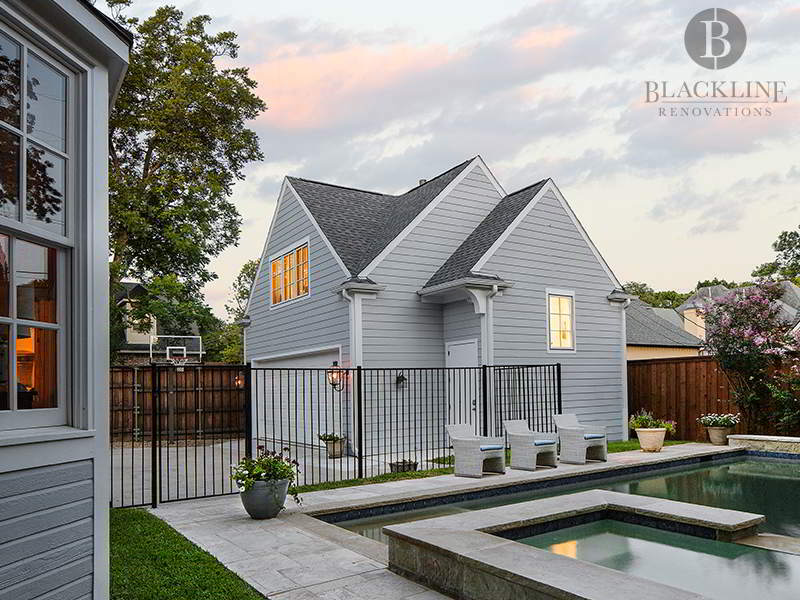 Blackline Renovations’ design-build model means that their clients don’t have to wrangle multiple sources to complete a project. Instead, the renovation process is streamlined and every detail is planned for in-house. This keeps surprises and stress to a minimum, a very good thing when working with a growing family. “Our house feels a lot like New England with its pitched roof, grey exterior and black shutters. We wanted the new garage to match the house,” said Paige. Using that Cape Cod color palette and feel, Blackline Renovations matched the new garage to the existing home, down to the gas lanterns. Inside, the in-law apartment continues the seaside theme with lots of white, navy blue, and black accents. The in-law apartment above the new garage also houses an office space to make working at home easier. “During the design process, Jennifer came to me with everything- samples, pictures, ideas. I felt like I could trust them with my vision for the project,” said Paige. While no home renovation project is easy for the homeowners, Paige said that Blackline’s communication and organization made the garage remodel as stress-free as possible. “Everyday, Taff would let me know what was going on that day and what was coming up during the week ahead. There were times when the water needed to be shut off- not an easy thing to deal with when you have 4 boys! But Blackline was great about letting me know ahead of time so that I could plan around it. I never felt bothered by the trucks coming and going or other disruptions because I knew when they would be happening,” said Paige. And just like that, another home and family grew- by one new baby, one garage, and one in-law apartment, all with two very happy parents and homeowners.